Opera Mini For PC: Hello buddies, Makey’s team again come with another latest update on Apps for PC ie., Opera mini for pc one of the fastest browsers. Nowadays everyone wants to get things done as fast as possible, like the same way we want to improve our internet speed with the best browsers available in the market. I think every internet user know about FireFox and Google Chrome, as they are the leading browsers in the present days. Some of you might have noticed about UC Browser, as it is made available for pc in the recent days. As we know nothing is perfect every browser has its own advantages and disadvantages. Opera Mini for Pc is also same like other browsers but it also has some advantages over other browsers. In this article we are presenting unique features of Opera Mini for PC and how to download Opera Mini for Windows, Mac, Linux, and Android & IOS Smartphones and Tablets. Opera Browser was initially available for better loading of the internet on mobile devices only. As time progresses they find the need to release it’s Desktop versions for all types of Computers like Windows, Mac, and Linux operating systems. It’s incredible features and speed in loading internet pages made this browser as one of the fastest growing browsers in the world. Opera also released different products like Opera Beta and Opera Mail for various devices including Android, IOS and Windows-based Smartphones. Let’s see some of the best features it supports and why it became one of the best browsers for PC. Speed is the main priority for any browser. Opera also worked on this and added improvements to speed it up on slower computers. Also if you are on slower internet connection Opera Turbo can compress pages for faster loading. Synchronize your browsing history where you left across all your devices by just sign in to your Opera Account to sync browsing data, bookmarks, passwords, and opera tabs. Personalize your Browser with over 1000 extensions. Download the extensions and themes you like from Opera’s add-ons catalog to get the best browser experience with personal touch. Simple to use with Opera’s intuitive combined address and search bar. you can Pick any search engines like Google, Yahoo or Wikipedia, or also can add a custom search engine. You can also customize keyboard shortcuts and mouse gesture. Safe and Private Opera keeps your browsing safe, so you can stay focused on the content. This secure browser protects you from fraud and malware on the web, and private windows help you stay incognito online. 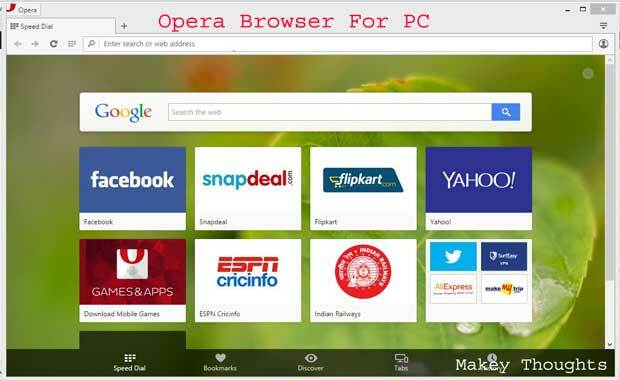 Opera Browser is available for all operating systems, it works same on all platforms. Opera Browser is available in both online and offline versions. In the online version, you need to download the link file and then install it with an internet connection. Whereas in the offline version you can download the complete Opera Browser application and then install it without an internet connection. We are providing both links, you can choose whichever is best suits for you. As we all know Opera is the best browsing software for all kinds of mobiles and tablets. It’s also available for Apple IOS Devices and Windows Phones. You can download Opera Mini for Android devices on Google Play Store. Opera released the different types browser for various kinds of operating environments. To discover new content and speed up slow connections with the fast, free alternative mobile web browser. To Experience the smooth way to browse on iPhone. And also get interesting news and amazing stories from all around the web. To Save the ton of data, watch more video and extend the life of your mobile plan with free data-savings app for Android. That’s it Guys, I hope you successfully downloaded Opera Mini For PC, Android or IOS whatever device you have. if you have any queries or suggestions feel free to post it on comments and also share this article with your friends on social media. Thanks for reading this article.